Aaron Davidson has been making films and taking photographs for over half his life. He is a photographer and videographer based in Miami Beach. In May 2015 he received his BAS degree in film, television and digital production from Miami Dade College. 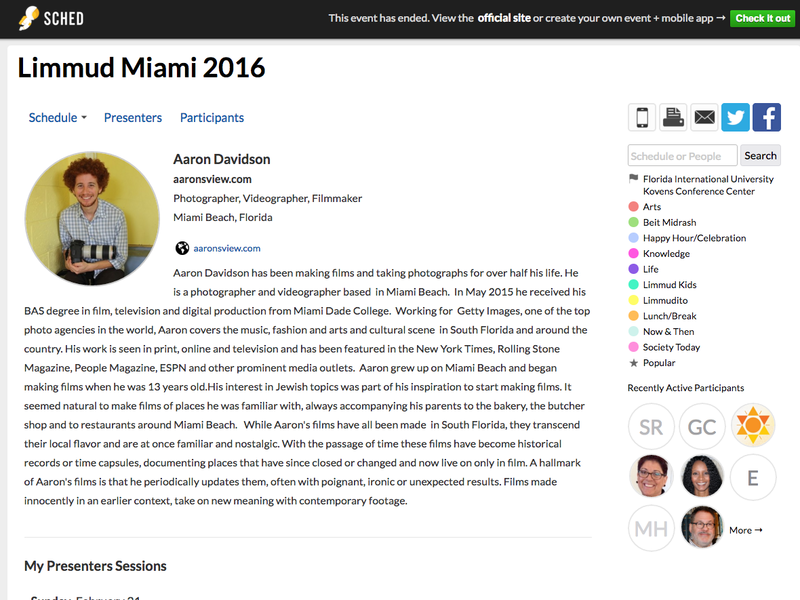 Working for Getty Images, one of the top photo agencies in the world, Aaron covers the music, fashion and arts and cultural scene in South Florida and around the country. His work is seen in print, online and television and has been featured in the New York Times, Rolling Stone Magazine, People Magazine, ESPN and other prominent media outlets. Aaron grew up on Miami Beach and began making films when he was 13 years old.His interest in Jewish topics was part of his inspiration to start making films. It seemed natural to make films of places he was familiar with, always accompanying his parents to the bakery, the butcher shop and to restaurants around Miami Beach. While Aaron’s films have all been made in South Florida, they transcend their local flavor and are at once familiar and nostalgic. With the passage of time these films have become historical records or time capsules, documenting places that have since closed or changed and now live on only in film. A hallmark of Aaron’s films is that he periodically updates them, often with poignant, ironic or unexpected results. Films made innocently in an earlier context, take on new meaning with contemporary footage.